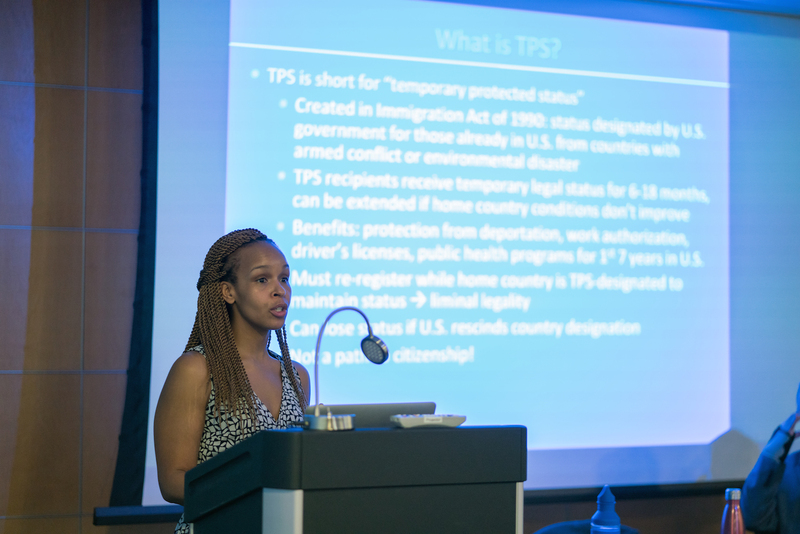 In response to the Trump administration’s decision to revoke Temporary Protected Status (TPS) for beneficiaries from El Salvador, Haiti, Nicaragua and Sudan, Long Island Immigrant Student Advocates hosted a TPS Teach-In session in the Humanities Building on Wednesday, Feb. 21. According to The Center for Migration Studies of New York, about 26,000 people in New York State receive TPS, a program that protects people from countries that are suffering from past natural disasters or current armed conflicts. Since as early as 1999, the program has allowed more than 300,000 TPS beneficiaries throughout the U.S. to work with authorization and live without the fear of deportation. The Trump administration ended TPS for about 450 Sudanese last September, some 50,000 Haitians and 2,500 Nicaraguans last November, and nearly 200,000 Salvadorans in January, which are all going to expire in 2019. Nancy Hiemstra, an assistant professor from the department of Women’s, Gender, and Sexuality Studies, said one of the reasons for ending the program was because people falsely assume immigrants like TPS beneficiaries are a drain on the economy. According to Long Island Wins, a nonprofit communications organization that focuses on immigration issues, the Immigrant Legal Resource Center estimates TPS holders in Long Island will contribute about 2 billion dollars to the Long Island economy. “They’re far from a drain on the economy. These are very much integral to our local and state economies,” Hiemstra said. Hiemstra, who studies private companies and individuals who lobby for policy changes, said much of the lobbying effort to get rid of TPS has been a “money making opportunity” for local governments. To help individuals who are about to lose their TPS, Carlos Piovanetti, a managing attorney at the Immigration Legal Services of Long Island, said people should organize to call officials, write letters, march in the streets and try to put as much pressure on officials as the lobbyists. Rodman Serrano, a senior English education major, said his parents fled from the Salvadoran Civil War in the 1990s to seek a better life for their family. Serrano said he is an introverted person who is very shy, but the January announcement of TPS termination for Salvadorans made him realize he has many privileges. “I feel the weight of responsibility for my parents’ sacrifices,” he wrote in a The New York Times op-ed article. “There are many things that I can do to speak out on behalf of my parents and to speak out on behalf of many families who don’t have the courage or fearing everyday what’s going to happen to them,” Serrano said. In September of last year, Serrano said he and a few others drove to Washington D.C. and encountered U.S. Representative for New York’s 2nd congressional district, Peter King. Serrano said he’s been volunteering for community services and organizations to advocate for resources for undocumented students and students whose parents rely on TPS to make the school more open and welcoming for everyone. A previous version of this article incorrectly stated the name Long Island Student Immigrant Advocates. The correct name is Long Island Immigrant Student Advocates.